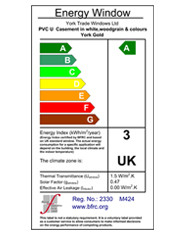 Recently a system has been introduced in the glazing industry which means double glazed windows can now be rated in the same way as white goods such as fridges and washing machines. The scheme is independently administered by BFRC (British Fenestration Rating Council) and means that tested and approved windows display a rating from A ? G with an A rating being the best performing. 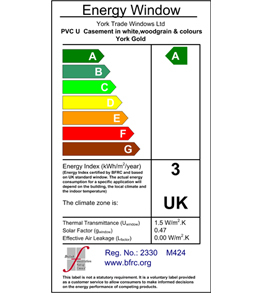 York Trade Windows are a fully registered BFRC registered manufacturer of energy efficient windows. The advantages to our customers who chose to purchase energy rated windows are as follows. Homes fitted with energy efficient windows benefit from lower heating costs as the windows help to keep heat inside the building whilst utilising freely available solar energy to warm the dwelling during the day. Changes to Building regulations have recently come in to force in England. 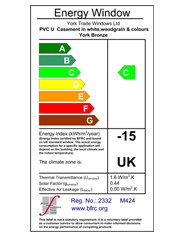 All of our energy rated windows fully comply with these new requirements. And the most energy efficient options that we offer far exceed the current requirements. In choosing an energy rated product from our range you are immediately contributing to the ongoing effort to reduce Co2 emissions which are a key factor in global warming. 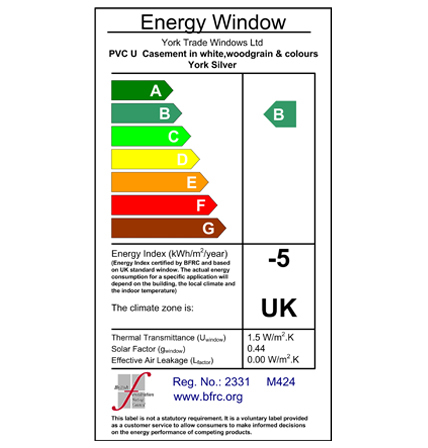 The windows are easily identified through the use of the widely recognised label as shown below. 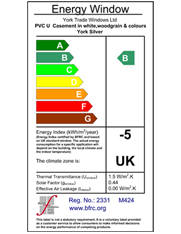 This is essentially the same rating system as used on household appliances for many years now which allows immediate assessment of the products relative performance in terms of energy efficiency.